Prosecutors Call for Arrest of Former South Korean President Lee - Integration Through Media ....! 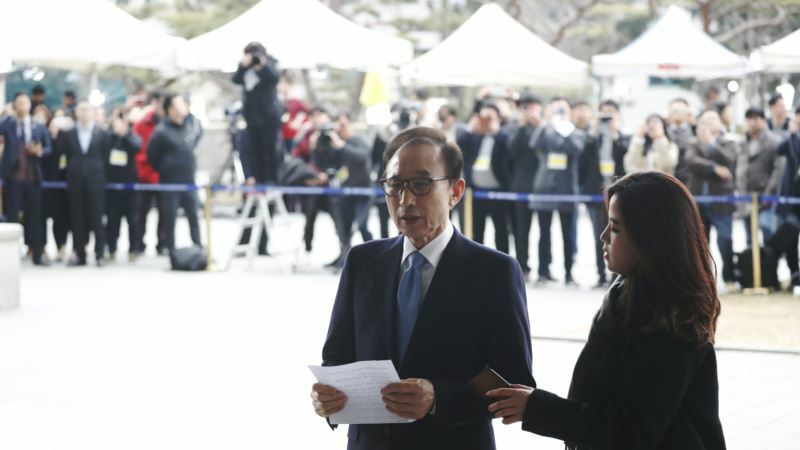 (VOA): South Korean prosecutors sought court approval Monday to arrest former President Lee Myung-bak on corruption allegations, saying they believed he would destroy evidence in the case if he was not apprehended. The prosecutors, after interviewing Lee for hours last week, are accusing him of the theft of millions of dollars from the country's intelligence agency, business groups and a former lawmaker. The Seoul Central District Court could rule later in the week on whether to issue an arrest warrant for Lee. If arrested, Lee, a conservative who governed from 2008 to 2013, would be the fourth surviving South Korean leader to be entangled in corruption allegations before leaving office or in the years afterward. He has denied the allegations, contending they are political revenge against him by the current liberal government of President Moon Jae-in. South Korean media quoted a senior prosecutor as saying, “Each accusation is a significant offense that requires formal arrest. We believe that there is a high risk of possible destruction of evidence” if he was not detained. The allegations against Lee include a claim that the electronics giant Samsung Group bought a presidential pardon in 2009 for its chairman Lee Kun Hee, who had been convicted of tax evasion and given a suspended prison term.